The skinsuit-wearing folk that worship at the alter of carbon fibre race bicycles and cite Chris Froome as their divine saviour will likely have been using Zwift for aaaages. But for the uninitiated, the innovative piece of software - that runs on Mac and PC desktops, smartphones and tablets - was originally unleashed by tech whizz kids Jon Mayfield and Eric Min in 2014 as an antidote to the boredom experienced when riding a static bike indoors. Both founders were keen cyclists, but noticed that they rarely had time to get out on their bikes thanks to being in-demand tech geniuses, so designed a basic graphics system and algorithm that would translate power generated on the static bicycle to movement of a virtual avatar. What exactly is HIIT… and what's the best HIIT workout gear? And the rest, as they say, is history. Zwift now enjoys millions of users in 150 different countries, all cycling around the virtual courses of Watopia, London and Richmond, competing in virtual races, taking part in virtual group workouts or merely breezing around the virtual environments. Said 3D environs are deliberately colourful and ever-changing, meaning there's always something to distract from the pain in your legs/arse. Where other cycling simulators have attempted to replicate the monotony of a French country road, Zwift has done completely the opposite. Runners and riders will traverse Mayan ruins, tackle deep jungle and buzz around a sort of Disney Pixar vision of London, while snow, rain and dazzling sunshine will come and go as the minutes tick by. There's also a social element, with the ability to track down friends, join virtual group rides and even use a built-in chat element to encourage fellow users or goad an individual's choice of outfit (you can change that too). Recently, Zwift also announced that its platform would expand to include runners so those that prefer to pound the treadmill can enjoy sharing the same space as the cyclists. As of October 2018, it has also introduced five new running routes and 5km of dedicated run-only paths to the software, meaning runners no longer have to share the virtual world as wannabe Hoys if they don't want to. The software requires a sensor attached to the appropriate equipment to work properly. This means you will need to invest in a simple Ant+ or Bluetooth speed and cadence sensor if you're a cyclist on a turbo trainer or a Bluetooth or ANT+ footpod attached to your trainers if you're running. Zwift takes a reading from these devices, runs it through its clever algorithms and translates this information into movement of the virtual avatar. The avatar's speed is dependent on the user's weight - which is input when registering - the speed and cadence of the cyclist's inputs, the gradient of the hill in the 3D world and whether the user is 'drafting' in the slipstream of a fellow Zwift-er. Similarly, the running software shares a very similar calculation but takes stride and speed information from the Stryd Live footpod or compatible smart treadmills, as opposed to the number of revolutions a bicycle crank is making. Thanks to this meaty information exchange, riders and runners can partake in virtual workouts, which prompt users to pump up the cadence, increase speed, hit a running rhythm and much more. This gamification of exercise is a huge part of Zwift's popularity and proves to be a damn sight more entertaining than mindlessly staring at 4Music while pounding a treadmill or static bike. On top of this, there are regular monthly challenges users can partake in, real races (sometimes with real prizes) and the ability to sit back and simply watch those far fitter than you are. What kit do I need to use Zwift? If you plan to put in the miles on the bicycle, you'll need a turbo trainer, static bike or a set of rollers. If you need some buying advice on any of those, you can check out one of our many extensive guides. A simple turbo trainer can be picked up for under £100 but it pays to spend slightly more and purchase something with built-in Ant+ and/or Bluetooth sensor technology. This means you won't experience the faff of adding additional sensors to your bike, although regular bike computer users might already have this sort of thing installed. However, Ant+ only sensors will typically require a special Ant+ dongle to communicate correctly with a computer, smartphone or smartphone running the application. In our humble opinion, it's best to stick with the Bluetooth enabled sensors or turbo trainers, as these connect effortlessly to the Zwift software and don't require any additional kit. Runners are currently limited to the Stryd footpod sensor if the treadmill in question isn't smart enough to communicate the vital information via Ant+ or Bluetooth. Next, you'll need a PC or Mac that was built in the past three years, an iOS smartphone with the app installed or a compatible tablet. This basic setup should be enough to get any keen runner or cyclist hooked on the software, but additional extras, like heart rate sensors and power meters, can give a more detailed picture of each workout. On top of this, those regular cyclists wishing to put in the virtual miles will likely want to invest in a good pair of bib shorts (to avoid chafing), some cycling shoes with cleats (in order to maximise power input) and a bloody absorbent towel to mop up the torrents of sweat. Similarly for runners, the correct clothing and running shoes will reduce any potential discomfort experienced when hammering the treadmill belt. How do I register for Zwift? It's as simple as logging on to the Zwift website and entering a few personal details, including height and weight (so the algorithms can function correctly) to create an account. We know it can be very tempting to lie about your weight to gain a competitive edge, after all, the system uses a watts-per-kilo calculation to decide speed in the virtual world, and inputting a ridiculous bodyweight figure will make things easier. Alas, it won't be long before other users report you for seemingly breezing past on the climbs and Zwift will step in to check everything is kosher. So you'll be truthful, won't you? Ok, but here comes the bad news: the system is no longer free. In fact, Zwift will ask for £12.99 a month to join the clan, which is a staggering 62 per cent price hike over the £7.99 fee of last year. According to its makers, this monthly membership covers the increased server space and ongoing development of the platform, with the expansion of routes and virtual worlds planned in the near future. Zwift offers a seven-day free trial for new sign-ups, so you'll be able to get a feel for the platform before committing. Oh, and running is free to anyone with a membership. Can Zwift help me get in shape? Don't just take our word for it (trust us, we've spent many hours immersed in this weird and wonderful 3D world), as numerous professional athletes have professed their love for the platform. Specialized Zwift Triathlon Team Member Bex Rimmington uses the system regularly for training purposes and found it to be the perfect companion when recovering from injury. "Last July I was involved in a bike crash during a stage race in the Czech Republic, I ended up breaking my wrist and ankle. But as soon as I was able to start rehab, I began riding my bike," she told us. "My boyfriend mentioned about signing up to Zwift as I started building up the duration on the bike again. It was the best thing I ever did. I was in plaster for 12 weeks with my wrist and then had surgery in January to resolve the problems, so Zwift allowed me to ride with others and made indoor training so much more fun than staring at a blank wall and watching the seconds tick by," she adds. 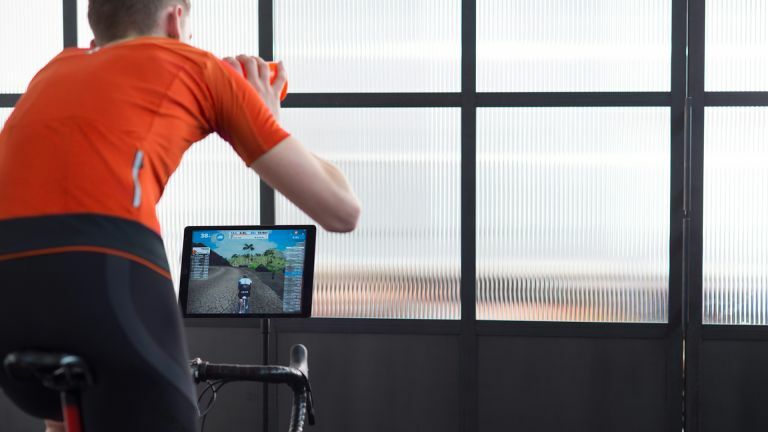 When first logging into the Zwift system, it's possible to select one of the many pre-populated workouts that have been designed to improve both running and cycling performance, as well as work up a sweat. Workouts range from rapid 30 minute leg destroyers, to lengthy two-hour stamina sessions. If you're not in better shape after tackling a couple of these a week for a month or so, you're doing something very wrong. And if cycling or running isn't for you, try one of our numerous other fitness programmes in the list below.